God loves sinners if they repent; Satan loves sinners even more when they don’t. 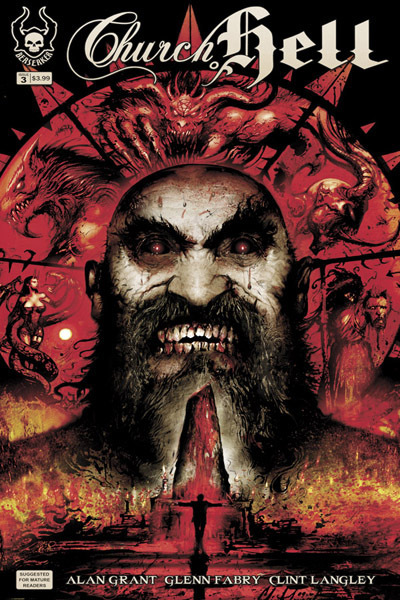 Welcome to the Church of Hell, that special place for sinners everywhere to meet old Uncle Scratch, and learn what it is really like to be caught up in the web of sinners, redemption, and failure as this story line works it’s way through your horror comic viewpoint. And this is what our intrepid explorers into the underworld learn, the Prince of Lies is just that, and any promises made are subject to reappraisal, and just a little spin when you work your way through the story line. This comic is not for the squeamish, if you want to look at the interior art, download a copy of issue 1, and otherwise see people’s faces melt off then you want to head on over to the Berserker Press web site by clicking on this whole sentence. Let’s face it, this is a disturbing comic book, but exactly what you would want out of a horror comic book. Full color, the tones for decayed and diseased flesh are that particularly nasty green color that artists know so well. This is a cut above the ordinary horror comic, and while not my particular thing, was excellently done. Good plot line, after all when you are making a deal with the devil you have to be very careful about the deal you are making. Nothing like more zombies, flesh rotting away, death, desecration and ruin to make your day when reading this comic book. It is not for kids, it is barely for adults, it is for people with a strong constitution and not to be read after eating a meal. Overall, everything you want in a horror comic without all the other stuff that goes along with it. They did a good story, good art, easily read letters, and how they got those colors is pretty much so anyone’s best guess, but they work and add to the lurid experience of the whole story line. And if you are planning on accidentally killing your date’s brother, yeah she is calling the police, and it goes down hill from there. Well worth adding to your collection of horror, there are three single issue comics right now, you can purchase them online, or download the low res preview copies from their own web site. 5 of 5 stars, make sure you have a towel to clean up the mess when you are done reading this one.